I don't think slapping Taunt on an unplayed card makes it suddenly playable. Fine. But taunt and spell damage are a bad combo. Khadgar + Eight mana spell -> into this. Not that good on it own, but it is definitely a superior target for that mage spell. I see your point and I agree to a certain extent, but this does help control/freeze mage prolong the game and IF the minion survives, you get a nice buff for your spells. The warden needs to be tested by the time the meta settles down, but he has potential to become a useful card. Usually you want to protect Spell Damage minions, and that keyword is essentially a soft taunt in a deck that includes it on purpose. So yeah, slapping taunt on Archmage isn't even neccesarily an upgrade, but with a body this beefy it's probably a slight improvement. But I've already wasted too much time talking about what is clearly a pack-filler/arena card. 5/7 taunt for 6 was played outside of C'thun decks, and that was druid only. I can't see why this won't see at least some play. 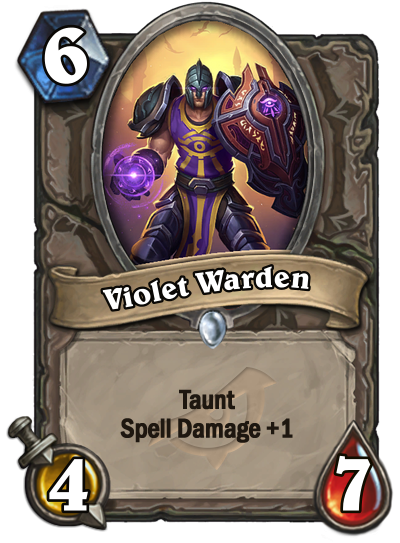 I will craft any golden legendary you want me to if Violet Warden is in a tier 1 deck in a month. I think this card won't see play in decks.. Spell damage minions have taunt sort of anyway..
Save your dust. I didn't say it will be part of a tier 1 deck, but I think people could test it out. Arena viable, and makes all the mage summon 6 drop cards better. Archmage says," Are you ready for this?" Violet Warden replies, "I am ready to replace YOU!" RIP Archmage. I guess spell damage has a lot of synergy this year though so you can't go wrong with additional options.